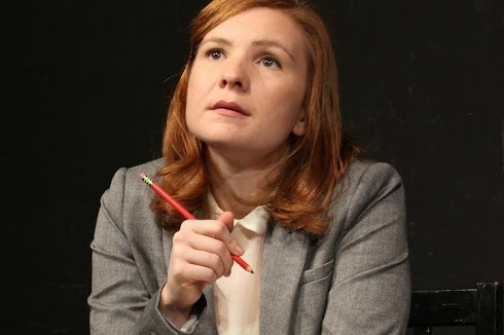 Katelin Wilcox in The Pawnbroker. BOTTOM LINE: A tidy, insightful, and provocative piece of storytelling for anyone who has every heard the name Bertolt Brecht. It’s a hefty amount of characters to be delivered in one hyphenated sentence. And it seems that’s where history will continue to place them. Wilcox takes it upon herself to remedy that by embodying and conquering all five of these historical footnotes with care. Director Jennifer Curfman navigates the changes with ease by assigning each woman a red prop: a scarf, a pencil, a flower lapel, knit hat, and handkerchief. It’s a tidy way to tell a story with multiple parts. The first of the women we meet is Zoff (or “Ma”) who will become Brecht’s first wife. Much of the play takes place in an imagined conversation with Herr Brecht, placed over the heads of the audience. Alternately we are addressed as the audience in which she can confide. Ma is infatuated by him from their very first meeting. Soon after, we meet Weigel (“Helli”) who flatters Brecht’s ego even more by wanting to be a part of his “dark and visceral” work. We begin to understand Brecht’s net to be quite wide and, indeed, it is even wider than this story could even tell for Brecht’s silent collaborators are vast. “He took anything that might be useful to him...He did not care for people; he put up with them,” the play quotes from playwright Elias Canetti. It isn’t until we meet Hauptmann that the play's secrets really start flying. She is Brecht's secretary who rather conveniently speaks English and introduces him to The Beggar’s Opera that will become The Threepenny Opera, arguably Brecht’s most successful work. And the timing couldn’t be more perfect as her own rejection as a writer is weighing on her. At least her attachment to Brecht allows her to realize her vision albeit unfairly compensated financially, in print, and in countless theater classrooms around the world to this day. There’s certainly more to be had here and my word count is waning. I can only summarize by recommending you check out The Pawnbroker -- for those who know the history and those who don’t. I do want to congratulate Wilcox and Curfman for their work. I am left wondering, however, what would come of the gift to spend more time with just one of these women. Certainly a whole play is waiting to be had of Hauptmann’s story (or Berlau, or Steffin, or Weigel, or Zoff). It’s a tough 75 minutes to work through and can feel like a book report of epic proportions. The most exciting moments are when we really get to understand the quiet pain, the resigning, even willful participation in the creation of genius. Thank you for telling their stories, Katelin Wilcox.